ZERO CLOSING COST PLUS $5,000 IN UPGRADES AVAILABLE ON THIS HOME!! The Concord II brings style and substance from its traditional exterior to the beyond basic floor plan. 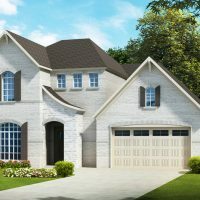 The over-sized 2 car garage gives you access to the mud room with a closet and boot bench before entering the hallway with easy access to 2 very nice size bedrooms plus the hall bath and centrally located you will find the laundry room making life simple for everyone. Doubly impressive are the 9′ ceilings throughout and beautiful hardwood flooring carried throughout the main living areas and hall. The kitchen sizzles with designer cabinetry, desirable pantry, full back splash, granite or quartz counter tops, a large island with double sink , GE energy star appliances and flows beautifully from the Dining area and large Family room with fireplace. Off the family room, the French door will take you outside to the relaxing covered rear patio. The Master suite has ample space and the master bath features double vanities, separate water closet, large fully tiled shower plus a garden tub and very big walk-in closet. Lowder New Homes has held nothing back with features like architectural shingles, tankless water heater, spray foam insulation, low “E” windows, fully landscaped yard and extra design details not to mention our unsurpassed warranty department that will take care of you after you move in for an entire Year!